We have wide dictionary of hyped up words today. Some of them include green revolution, non-conventional energy resources and pollution control. When we say pollution, there are many things that come to our mind; water, air, sound and land being our primary concern. All these pollutions we are familiar with, but do we know the definition of pollution? Pollution is described as introduction of contaminants into the natural environment that causes adverse change. Here precisely the contaminants are termed as harmful to both human beings and the environment. But can it be possible that a contaminant may be beneficial to human but have an adverse effect on the rest of the environment? Or still further it is beneficial only to some humans, while proves as a nuisance for some. Artificial lighting is the ultimate example of this type of pollution. It is termed as lighting pollution. Any amount of excess of light, where it is not required is termed as pollution. Then this light could also be a light coming from your house disturbing your neighbor’s sleep. It could be up-lighting on facades of buildings or flash lights shot into the sky disturbing the routine of nocturnal animals. It could even be excess of streetlights in less crowded areas hampering the view of star gazers and astronomers. Imagine coming tired home, wanting a good night sleep on a weekday. But your neighbor is having a bright party, with flashlights shooting up your glass window, penetrating right through your curtains and onto your closed eyes. And now you can’t even sleep. He is not making noise, so you can’t even complain. Well, you can’t complain in India. But in most of the developed countries you can complain about this situation under light trespass. 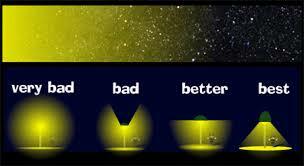 Any light entering your property, against your will, after sunset can be registered as an offence of light pollution. This term was initially introduced by star gazers, since they couldn’t look onto any stars from their comfortable homes in the city. It was majorly for light going in the vertical direction up in the sky, which hampered the view of the celestial objects. For most of Earth’s history, our spectacular universe of stars and galaxies has been visible in the darkness of the night sky. From our earliest beginnings, the vast spectacle arrayed across the dark sky has inspired questions about our universe and our relation to it. The history of scientific discovery, art, literature, astronomy, navigation, exploration, philosophy, and even human curiosity itself would be diminished without our view of the stars. When we walk solely in moon light, our eye becomes accustomed to less amount of illuminance; as a result we can clearly see the dimly twinkling stars and lit planetary objects in the night sky. With excess amount of artificial light being present both in the surroundings and projected onto the night sky, the sky just becomes a dark mass, devoid of all celestial objects. Here there is no room for such curiosities about the vast expanse of the universe. Today, many star gazing groups have to travel to distant remote locations to get a clearer view of the night sky. Not just humans, but animals are also affected by light pollution. Both bright days and dark nights are necessary to maintain healthy hormone production, cell function, and brain activity, as well as normal feeding, mating, and migratory behavior for many species, including humans. 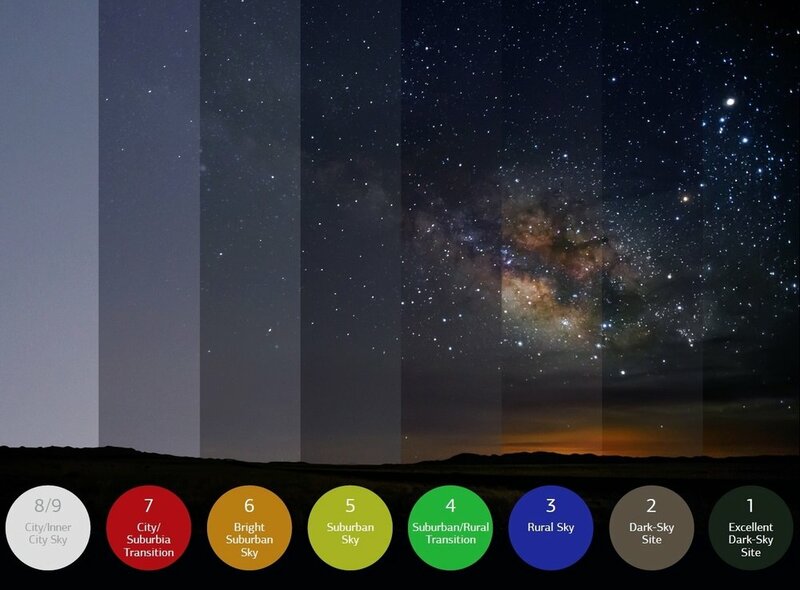 Basically, light pollution affects the circadian rhythm of diurnal animals. But the most affected are nocturnal animals like bats. Their eyesight is evolved to work best during dark hours. They hunt in the dark, roam in the dark and eat in the dark. They cannot perform their normal activities because of excess artificial light being present in their environment. Lighting pollution can be classified into four different types. 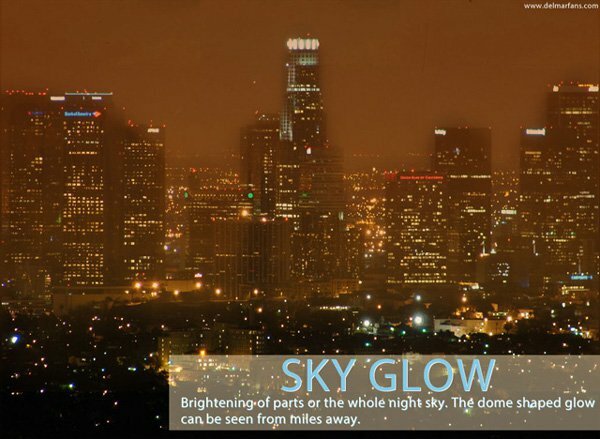 Urban Sky Glow—the brightening of the night sky over inhabited areas. Affecting the star gazers and nocturnal as well as diurnal animals. Glare—excessive brightness which causes visual discomfort. High levels of glare can decrease visibility. A car coming from opposite direction using a high beam light on a dark unlit road. Clutter—bright, confusing, and excessive groupings of light sources, commonly found in over-lit urban areas. The proliferation of clutter contributes to urban sky glow, trespass, and glare. Indian green building council has set a credit aside for addressing the issue of lighting pollution. However neither IGBC nor ECBC (energy conservation building code) are mandatory as yet in India for any type of buildings. Today like addressing any other pollution and environmental problems, it becomes our moral responsibility as conscious co-inhabitants of planet earth, to look onto this problem with equal dedication. We owe it, not just to fellow humans but rest of the living world of this planet. So how can we work towards reducing lighting pollution? There are few simple thumb rules. For façade lighting down-light your building instead of up-lighting, just for the need of aesthetics. 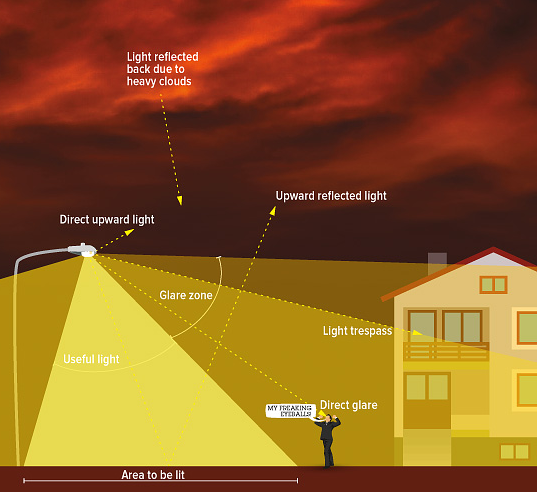 When designing or choosing street lights, make sure that no more than 5 % of the illuminance goes above 90 degrees z axis, meaning there is a solid cap above the light bulb that prevents light from being emitted directly to the sky, to minimize sky pollution. Select exterior light fixtures with cutoff angles to prevent light from escaping above the horizontal plane (nadir), minimize up-lighting, and reduce high-angle brightness. Use compact fluorescent lamps (CFL) and LED bulbs that produce warm white lighting. Many LED lights emit a blue short wavelength light that scatters easily into the atmosphere, which causes eyestrain, impairs night vision and adds to light pollution. Turn off any unnecessary outdoor lights when you are home for the night or before going to bed to prevent wasteful dusk to dawn lighting. If you’re in doubt, turn them off by 11 PM. While you’re at it, make sure to turn off indoor light fixtures, like wall lights, when you’re not home or before bed to reduce energy consumption. For a detailed comprehensive study you can always refer to http://www.delmarfans.com/educate/basics/lighting-pollution/#prevention website.